Without Lionel Messi for almost an hour, Barcelona managed to get the draw it needed to reach the Champions League match knockout stages. It was drab 0-0 draw at Juventus, though, despite Paulo Dybala's efforts to spark it into life for the home side. The point was enough for Barcelona to secure top spot in Group D. Juventus remained second in the group but is only a point above Sporting Lisbon, which beat Olympiakos 3-1. Juventus, which reached the final in two of the last three seasons, visits Olympiakos in the last round, while Sporting travels to Barcelona. "Leaving Messi out was difficult but he has played a lot this season and has a lot of responsibility on his shoulders too," said Barcelona coach Ernesto Valverde. "Today we saw a long and tough contest so we thought a rest would do him good. "We knew the game could open up in the second half, so I wanted to both let him rest and have an option to shake things up." Ivan Rakitic went closest for Barcelona, with a first-half free kick that went past a number of players before hitting the right post. Dybala almost scored in stoppage-time for Juventus but Marc-Andre Ter Stegen palmed his effort around the post. "We had our chances, what a pity for that ball at the end," Dybala said. "Now we have to be good and win the match against Olympiakos and not wait to see what Barcelona do," against Sporting. 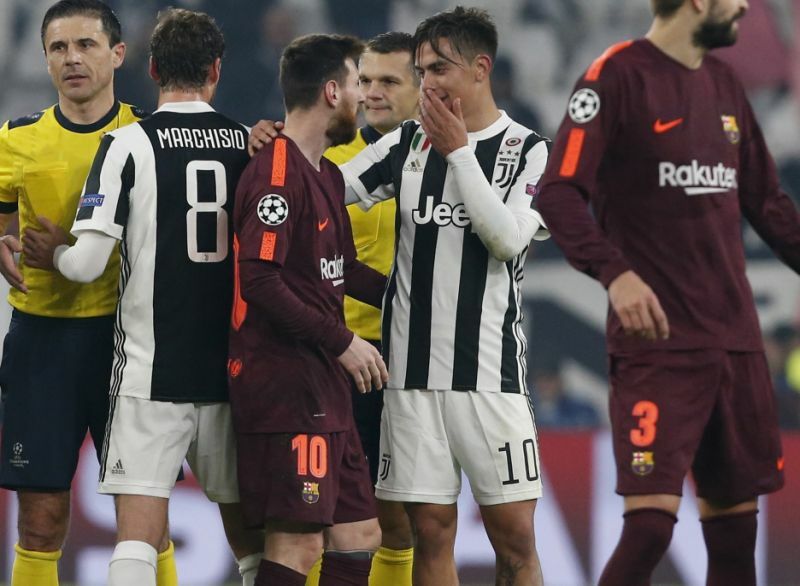 Juventus had beaten Barcelona 3-0 in Turin in last season's quarterfinals on its way to the final. But the Bianconeri had lost at Barcelona by the same scoreline earlier this campaign. "We played against a very good team and it was not an easy game to win," Dybala said. "In comparison to last year, they defended much better and it wasn't easy to get into the area." Dybala has long been compared to Messi - his international teammate at Argentina. Dybala was at the heart of most of Juve's good moves and he also almost scored at the end of the first half when he took the ball round a couple of defenders before unleashing a shot which flashed over the bar. Apart from brief moments like that, the match was short on quality, despite featuring two such prestigious sides. There were plenty of mistakes, notably from Juventus striker Gonzalo Higuain, who slipped in the middle of the area on one occasion and also lost the ball in a good position. The Argentine also fired an opportunity over the bar, while both lineups were guilty of some sloppy passing.